Even with incredible pitching, tight games will come down to a single play resulting in the difference of a single run. Is your defense ready? Check out 3 ways to improve your defense and win more close games. When your defense boots a ball, it’s easy to pass blame on the offending player, or even on the pitcher for letting the ball get hit (the nerve of her). And yet, when you peel the layers back and take a closer look into botched plays, you’ll often find that players often had to rush their play. The majority of the time players rush because the batter/runner was faster than they thought, or the ball wasn’t. Reading a batter or runner’s speed is simply a matter of paying attention and scouting. While reading the speed of the ball is the ultimate determination in where the fielder makes the play, controlling that speed is literally out of the player’s hands, but reading it correctly isn’t. She can control how closely she pays attention to the speed of the ball. And where she positions herself is under her control as well – or at least under someone’s control. Simply starting in position to make the “most likely play” is putting your defense one step closer to making it successfully. The basic concept of all team defenses is to take away the opponent’s strength, based on the situation. In other words, take away the thing “most likely” to happen. But keep in mind, to take something away by being strong in one area, you leave yourself weak in another area. Your 1st Base – The 1st baseman is usually the slowest player among your infielders and her footspeed to move forward AND backwards to the base will determine where you can play her – so don’t let her footspeed hurt you. Normally, with a slow 1st baseman in a bunt situation you’ll be better off playing in a 1 Back coverage (shown on the right). This allows her to play back near 1st, which limits her up and back movement, while still allowing you to cover all 3 bases plus the bunt. It also means what you give up is the area in front of 1st, so your pitcher is going to have to play defense. 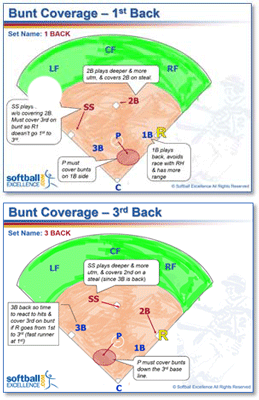 However, if your 1st baseman is fast up AND back you can play her up in bunt situations (3rd Back shown to the right) – which allows your 2nd baseman to play back and cover her defensive area as well as cover 2nd base. College 1st baseman are VERY fast which allows them to be up in defensive coverages as well as back covering 1st on the throw. That’s something most travel and high school teams won’t be able to do. Lesson: Use the coverage that works best for the speed of YOUR 1st baseman, instead of the coverage your favorite college teams uses on TV. Your Pitcher – Lots of team defensive coverages depend on the quality of the pitcher – meaning both her speed as well as her ability to hit her targets. 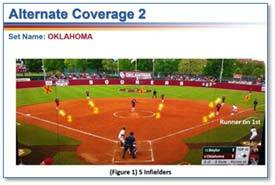 The University of Oklahoma has made alternative team defensive coverages famous by playing in a 5 infielder shift. They do this when Paige Lowary is pitching, it’s a very tight game and they need to get a force at 2nd. As you can see in the picture to the right, they overload the right side of the infield with an extra infielder and remove their leftfielder. Since Paige Lowary throws over 70 mph, most righthanded hitters are late on the ball which means they hit it to the right side of the infield. So OU asks Paige to throw an outside pitch and hopes the batter hits it right into the heart of their defense. If she pulls the ball, well, that’s a whole different story. Remember, you always give up something to get something on defense. Lesson: Your defensive coverage is only half of the picture. Your pitcher must throw to a location that makes it more likely the hitter will hit into your coverage. That’s why the coach calling pitches needs to sit next to the coach positioning the defense – to be effective they must work in tandem. 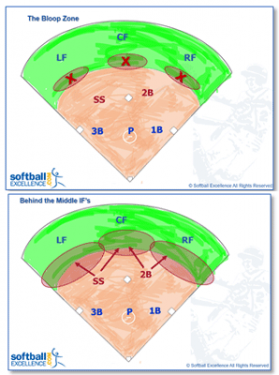 Cover the Bloop Zone – You’re going to have far more balls land in the Bloop Zone – that area behind your middle infielders and in front of your outfielders – than you’ll have balls rocketed into the gaps. But, those gap-rockets are way more memorable since they’re hit hard, and usually follow a couple of bloopers, so they do extreme damage. So, the third key to your team defense helping you win close games, is to eliminate the Bloop Zone by training your Shortstop and 2nd baseman to play behind them! The farther behind them they’re able to play, the farther back your outfielders can safely move – thus giving them more range to cut off hard hits in the gap. The increase is hitting skills and bat technology has resulted in more players hitting the ball hard. This forces our outfielders to play back farther, only creating a larger area in front of them – which is the Bloop Zone. Practice diligently with your SS and 2nd base to pursue every flyball behind them in the Bloop Zone, and to expect to catch it as soon as they see the ball headed for that zone. Lesson: Middle infielders must be fast. They’ve got to play in front, beside and BEHIND them to ensure bloop singles become outs, less runners end up on base, and your team successfully navigates those 1 run ballgames. Remember coaches – calling out a team defensive coverage from the dugout is COMPLETELY different from your team having spent time practicing that defense!